Words on a screen come with many advantages. But typing never feels quite as instinctive as ink on paper, particularly when making notes. The Equil Smartpen 2 does a great job of digitizing scrawls and doodles, and it's currently 23% off for io9 readers. While the Smartpen is clearly a fraction more bulky than your average biro, it can track every scribble you make on the page, and turn it into something digitally useful. For instance, the pen can convert handwriting into editable text, or put drawings up on screen — it's sensitive enough to log small details and the pressure you apply. 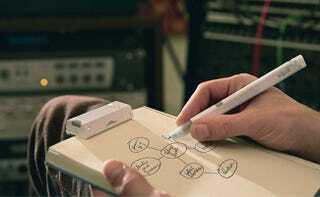 The system works with Windows, Mac, Android and iOS, although the pen itself is totally independent. It also works nicely as a standard pen, with various tips and colors available.